Other common names: Purple foxglove, thimbles, fairy cap, fairy thimbles, fairy fingers, fairy bells, dog's-finger, finger flower, lady's-glove, lady'sfinger, lady's-thimble, popdock, flap dock, flop dock, lion's-mouth, rabbit's-flower, cottagers, throatwort, and Scotch mercury. Habitat and range: Originally introduced into this country from Europe as an ornamental garden plant, foxglove may now be found wild in a few localities in parts of Oregon, Washington, and West Virginia, having escaped from cultivation and assumed the character of a weed. It occurs along roads and fence rows, in small cleared places, and on the borders of timber land. Description: Foxglove, a biennial or perennial belonging to the figwort family (Scrophulariaceae), during the first year of its growth produces only a dense rosette of leaves, but in the second season the downy and leafy flowering stalk, reaching a height of 3 to 4 feet, appears. The basal leaves are rather large, with long stalks, while the upper ones gradually become smaller and are borne on shorter leafstalks. The ovate or oval leaves, 4 to 12 inches long and about half as wide, the upper surface of which is dull green and wrinkled, are narrowed at the base into long winged stalks; the lower surface of the leaves shows a thick network of prominent veins and is grayish, with soft, short hairs. The apex is blunt or pointed and the margins are round toothed. 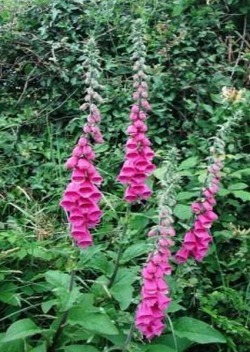 When foxglove is in flower, about June, it is a most handsome plant, the long terminal clusters (about 14 inches in length) of numerous tubular, bell-shaped flowers making a very showy appearance. The individual flowers are about 2 inches long and vary in color from whitish through lavender and purple; the inside of the lower lobe is white, with crimson spots and furnished with long, soft, white hairs. The capsule is ovoid, two celled, and many seeded. Collection, prices, and uses: The leaves, which are official in the United States Pharmacopoeia, are collected from plants of the second year's growth just about the time that they are coming into flower. They should be very carefully dried in the shade soon after collection and as rapidly as possible, preserving them in dark, airtight receptacles. The leaves soon lose their medicinal properties if not properly dried or if exposed to light and moisture. Foxglove brings about 6 to 8 cents a pound. At present most of the foxglove or digitalis used comes to this country from Europe, where the plant grows wild and is also cultivated. Foxglove has a faint, rather peculiar odor and a very bitter, nauseous taste. Preparations made from it are of great value in affections of the heart, but they are poisonous and should be used only on the advice of a physician.